An overnight stop in Venlo, Netherlands, to break the journey back to Brussels. The representative from the Trade Union in Aabenraa asked an interesting question, ‘when and why did we stop trusting people who receive social assistance?’. Trust is central to creating adequate, accessible and enabling minimum income schemes. Trust that people, in or at risk of poverty, have the intelligence to know how and which opportunities to take, the willingness and creativity to contribute to society and the desire to do meaningful work. If the system doesn’t show trust in them, how can they trust the system. Trust makes the world go around and more equal societies build trust. So, let’s create systems that ‘Guarantee access to adequate and enabling minimum income schemes. No one deserves less, and everybody benefits’. Time to thank the thousand and more volunteers who helped on this bus trip, both the teams on the bus and the reception teams in the villages, towns and cities where we stopped. A thanks to the municipalities, politicians, civil society organisations, religious communities, trade unions, academics, Commission representatives, civil servants, media, and the countless individuals who turned out to welcome the bus and to tell their stories and to support our campaign. A particular thanks to the EMIN Coordinators for the great work they have done. Thanks also to my colleagues in the EAPN staff team in Brussels and in National Networks where we have staff, once again, literally going the extra mile, to make our work a success. 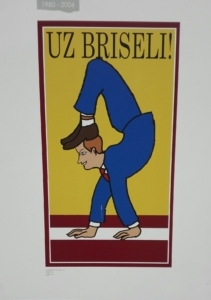 Europe is different and better because we made this #eminbus journey. 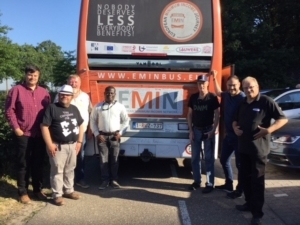 Picture: Last Team on EMIN Bus 2: Heiki (Estonia), Juha (Finland), Fintan (Ireland), Alias (Belgium), Harald (Norway), Andre (Malta) and Marcel (Driver/Belgian).